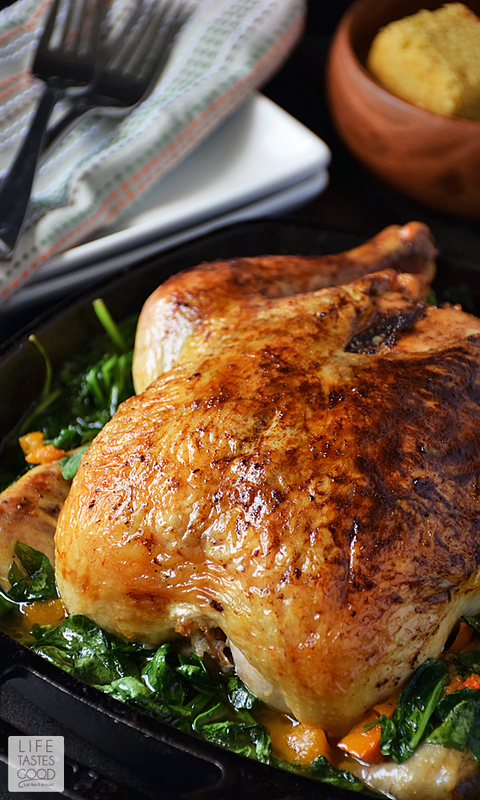 Whole Roasted Chicken with Vegetables is a comforting meal perfect for the fall season. 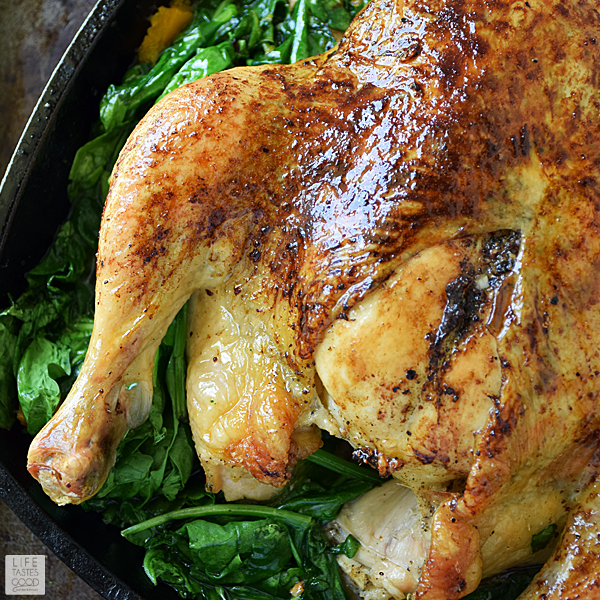 In addition to the roasted chicken, this complete dinner also incorporates my favorite fall flavor, butternut squash, and Popeye's favorite veg, nutrient rich spinach all cooked together in one skillet. That's a lot of good-for-you stuff all in one pan! The #SundaySupper Tastemakers have been busy in the kitchen creating fall inspired recipes to celebrate the flavors of the season. At the bottom of this page you'll find links to all of this week's #SundaySupper recipes. You'll want to click on each one to start planning your fall inspired meals. A big thank you goes out to The Sunday Supper Movement for making this event possible. I am so looking forward to the cooler temperatures and drier weather fall brings to Florida! It's been a long, hot summer, and I'm ready to emerge from my hibernation to enjoy the beautiful weather, as well as turn on the oven and actually welcome the warmth in our home. Yes, this time of year that transitions us from summer to winter, is a welcome one in our house! 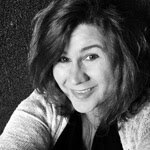 The way I cook just seems to naturally change with the weather, so as fall approaches and I'm anxiously awaiting the cooler temps, I start to move toward those cooking methods I've missed all summer long. Roasted or braised meals, taking advantage of seasonally fresh vegetables, replace the faster grilled or sauteed meals we enjoyed over the summer. 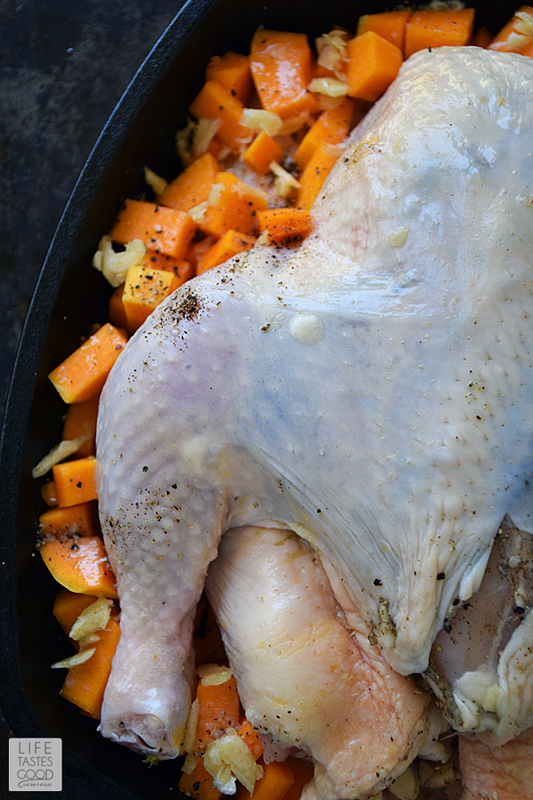 This recipe for a whole roasted chicken with vegetables is one of my faves, because it is so easy to make, cooks all in one skillet, and is budget-friendly too! This meal is less than $4 per person!! You can't eat out for that price! Less mess and less money is a good combo, don't ya think? To make this delicious dinner, preheat the oven to 400°F. Rinse the chicken and pat dry. Retrieve the neck and giblets from the cavity and discard or save them to make broth for another use. Carefully loosen the skin from the breast and legs by gently pushing your fingers under the skin. Prepare the rub by combining 1 1/2 tablespoons freshly minced garlic, 1 teaspoon of salt, 1/2 teaspoon pepper, and 1/2 teaspoon of dried sage. Rub the garlic mixture on the meat under the skin. 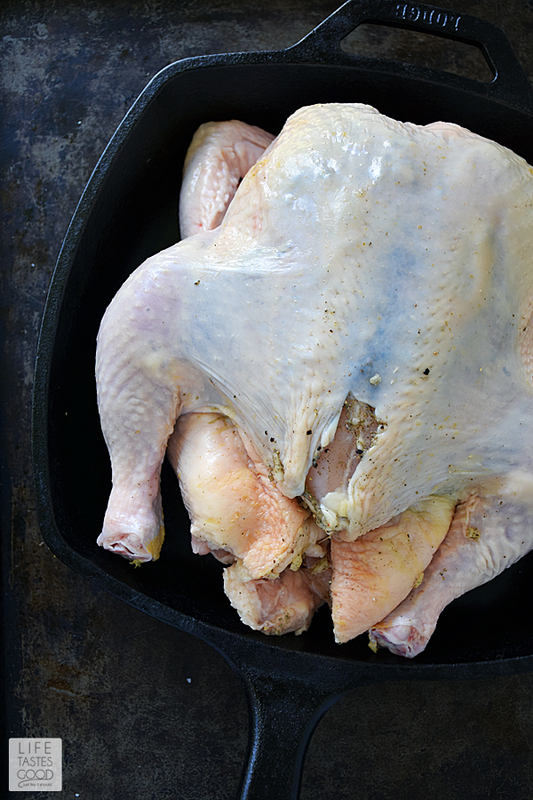 Tuck the wing tips under the chicken like you would put your hands behind your neck to kick back and relax in the sun. Add chopped butternut squash and freshly minced garlic to the pan all around the chicken. Season with 1/2 teaspoon salt and 1/4 teaspoon pepper and pour 2 tablespoons melted butter over the squash. Brush the remaining 2 tablespoons melted butter on the chicken skin. Tip: Use a vegetable peeler to remove the outer skin from the butternut squash. Place the skillet in the preheated oven and set the timer for 1 hour. Pour a glass of wine and find a quiet place to relax! You are officially 'busy cooking dinner'. It's hard work but someone has to do it, right?! After an hour, check the internal temperature by inserting an instant read thermometer into the meatiest part of the thigh. If the temp registers 160°F, you're ready to add the spinach. Carefully (don't burn yourself) stuff the fresh spinach leaves all around the chicken pushing it down into the liquid as much as you can. It will look like way too much, but don't worry, the spinach will wilt and shrink and, if you're like me, you'll wish you had more. Marvel at the beauty. Isn't that gorgeous?! Put the skillet back in the oven for another 5 minutes to wilt the spinach. The leaves on top will look a little dry, but that's okay. After the 5 minutes is up, remove it from the oven and push those leaves down into the liquid. Let rest for 10 minutes before carving. Enjoy! Preheat the oven to 400°F. Rinse the chicken and pat dry. Retrieve the neck and giblets from the cavity and discard or save them to make broth for another use. Carefully loosen the skin from the breast and legs by gently pushing your fingers under the skin. Place the chicken in a 10-12 inch cast-iron skillet. Add chopped butternut squash and 1 teaspoon freshly minced garlic to the pan all around the chicken. Season the squash with 1/2 teaspoon salt and 1/4 teaspoon pepper and pour 2 tablespoons melted butter over the squash. Brush the remaining 2 tablespoons melted butter on the chicken skin. Tip: Use a vegetable peeler to remove the outer skin from the butternut squash. Place the skillet in the preheated oven and set the timer for 1 hour or until an instant read thermometer registers 160°F when inserted into the meatiest part of the thigh. Carefully (don't burn yourself) stuff the fresh spinach leaves all around the chicken pushing it down into the liquid as much as you can. It will look like way too much, but don't worry, the spinach will wilt and shrink and, if you're like me, you'll wish you had more. Marvel at the beauty. I'm always looking for new roast chicken recipes. This looks delicious and is definitely going into the "to try" file. I'm like you - always on the lookout for new chicken recipes! Thanks for stopping by today :) Happy Sunday! Every time I see your food I say out loud "I want to eat at Marion's house!!" This looks absolutely delicious and I love everything about it! I think that Roast Chicken has to be comfort foods at its best. It fills up the house with amazing flavors!. I love that in every family, each piece of chicken has its owner! my is the thigh of course! and having veggies cooked in the juices is just perfect! well done! 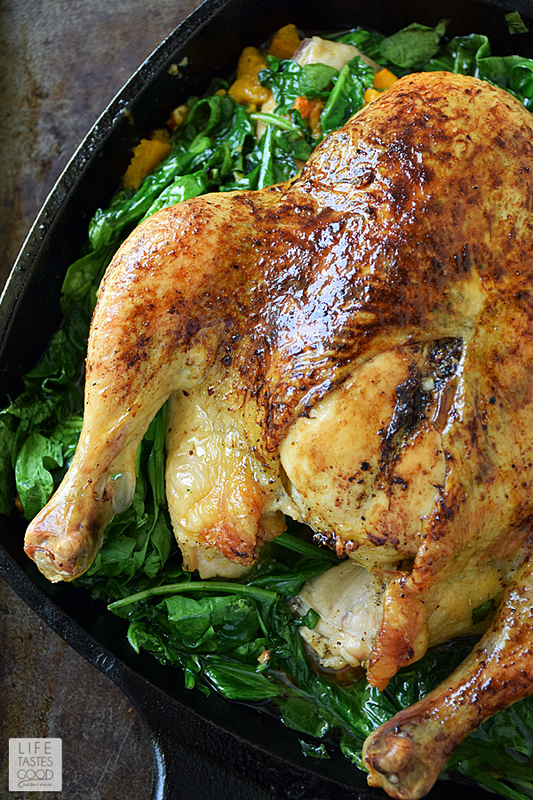 Oven roasted chicken is the perfect Sunday dinner -- can't beat an all in one meal either. Gorgeous color on that bird! This looks wonderful Marion! I'd join you for dinner any day you make this! 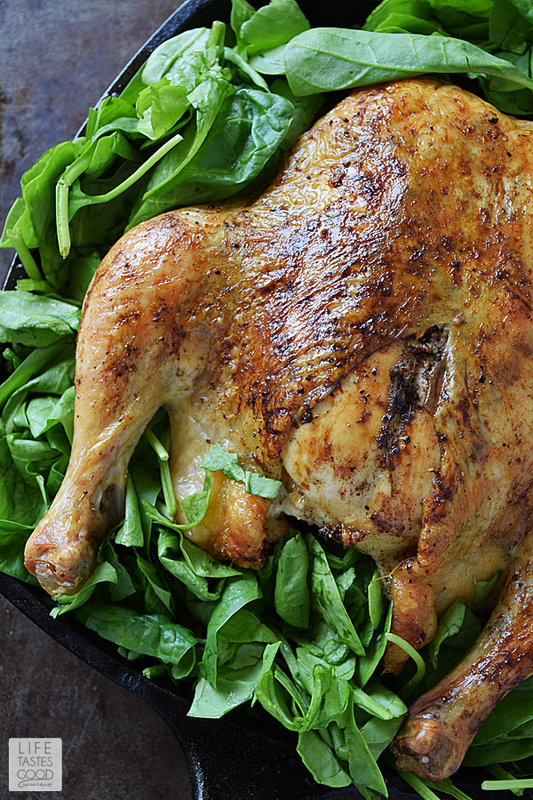 We were on the same wavelength this week with roasted chicken! Nothing smells more comforting while it cooks. Love the addition of spinach here. Beautiful color on your chicken. Makes my mouth water! Ab.so.lute.ly beautiful. That browning you've achieved is simply perfect! This chicken is total Fall fare through and through. I'm jealous!